Volute casing pump, single-stage, radially split volute casing. High efficiency centrifugal pump. Multistage, horizontal monoblock centrifugal pump. Multistage, vertical, high-pressure centrifugal pump in ring-section design with suction and discharge nozzles of identical nominal diameter. Fully automatic package pressure booster system with two to six vertical high-pressure pumps and VSD. 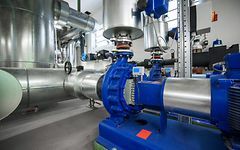 Automation and pumping solutions for efficient building services systems.